Well this is it, a New Year a New Planner. Except this year I have not got a commercial planner but have been making my own inserts using Microsoft Word and a ream of 160 gsm paper from Staples. They very kindly cut it down to A5 size for a very reasonable fee. Paper has been a pain! I really wanted a good 140 gsm paper which would be similar to last years IWP paper but was unable to locate it here in the UK. The choice was thinner or thicker. Given that I wanted the paper for stamping I thought the thicker would be better and opted for a 160gsm product that is just a smidge short of card. However, this was not necessarily so....I have to say the paper feels fabulous, soft and luxurious but I have had variable results stamping direct to paper. Week one went really well. I used an image from Faery Ink, printed on to sticker paper and coloured up using alcohol markers. The background was lightly sponged with Stampin` Up ink pads. I have used the 1/4 set up that I started using toward the end of last year. It is really good for decorating but maybe a bit unstructured for planning. 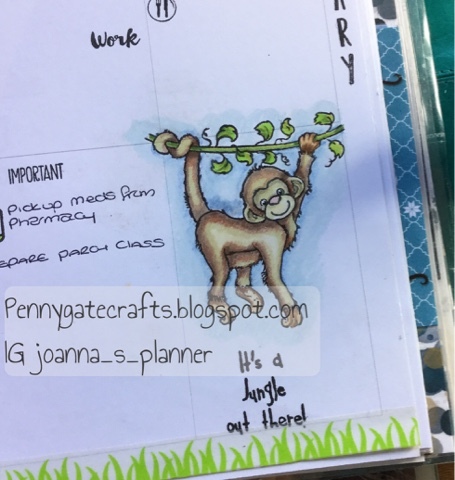 Week two, Monkey Week (rubber stamp for Kraftin Kimmie). 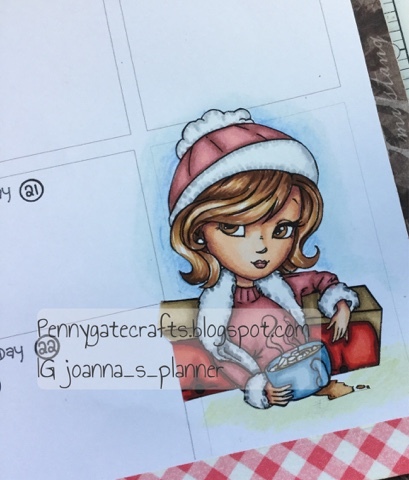 This week I decided to stamp direct to planner and colour with prismacolor pencils. This technique worked really well on this paper but if you look closely you will see I have not been doing a lot of actual planning...the mojo is still hibernating. So, what to think? Do I wish I had opted for the commercial option? This is a really difficult question to answer. Here in the UK we have to pay an awful lot to import planners. That linked with the decrease in the value of the GBP£ and the customs fees that are seldom avoided, meant that buying another IWP would be incredibly expensive...something akin to about $90-$100 and possible more. 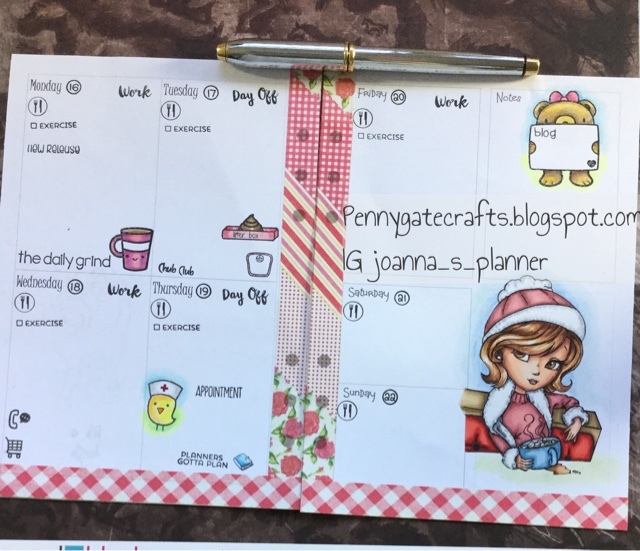 I also had the option of a Happy Planner which I could punch to fit my Filofax or the `Personal-Planner.com` which is an A5 Product. 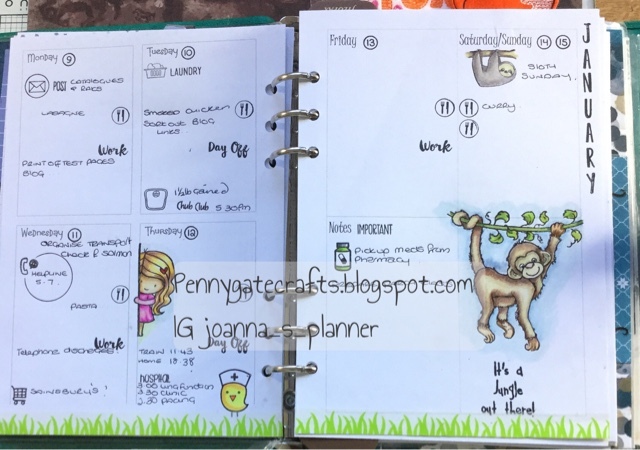 I have used the `Personal Planner` before and whilst I love all the options for personalisation I was unable to buy this planner in an un-punched and un-bound form. There were a few issues that I did not like and despite enquiry these could not be changed. However, for European ladies this is a very good option if you like a bound planner. 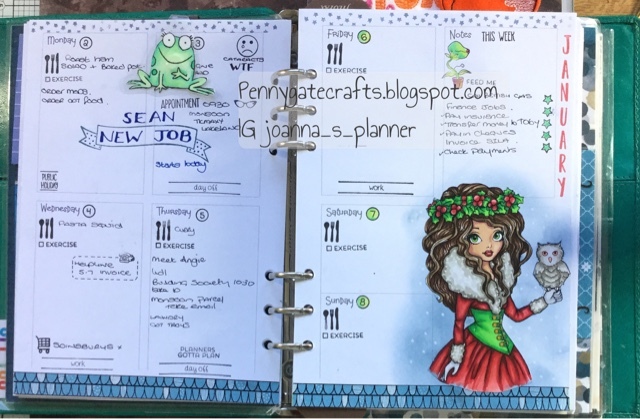 The Happy Planner is not an A5 product and I don`t have any experience of it...to be honest I am not sure anything would compete with my love of the IWP. As you know I started playing with inserts last year and started with this quarter layout. I have now started to experiment with a few other layouts which I will show you shortly. Making my inserts is really testing my IT skills but hopefully I will achieve `planner peace`. If not, I will certainly have the option to test drive different layouts and challenge myself to try different decorating styles.